The world is currently facing two serious environmental issues, ozone layer depletion and global warming. One of the major contributory factors in the air conditioning industry is the refrigerant gas used in the equipment. In the past, each generation of refrigerants was considered to be the optimum one to use. With the Montreal Protocol implemented by as many as 200 countries now, harmful chloro-flouro carbon (CFC) and hydro-chloro-flouro carbon (HCFC) refrigerants are being replaced with new alternatives, which are less harmful to the environment. Such refrigerants qualify as they have zero ozone depletion potential (ODP) and low global warming potential (GWP) while maintaining high system energy efficiency. Although it took seven years to come to fruition, the Kigali agreement to amend the Montreal Protocol and substantially limit the emission of hydro fluorocarbons (HFCs) that contribute to global warming represents major progress. The important role played by this group of chemicals, used in refrigeration and air conditioning, is evident from the scientific estimate that without a mitigation plan, HFCs could warm the world by an additional half a degree Celsius by the end of the century. As with other such global compacts on environmental matters, India pressed for a more lenient deadline at the Rwanda negotiations. Ultimately, it agreed to start freezing HFC use in 2028, four years later than its peer club countries China, Brazil and those in Africa, and achieving maximum reduction by 2047, two years after they do. In welcome contrast, however, India has ordered the manufacturers of HFC 23 — a by-product of another chemical used in refrigerant gas manufacture and with a staggeringly high contribution to global warming — to now capture and dispose of it at their own cost. The decision is of particular significance, considering the expansion of refrigeration and air conditioning in India with a rise in incomes, leading to higher levels of HFC release into the atmosphere. One of the questions before India in its implementation of Montreal Protocol commitments is the need to align its goals for Make in India with green technologies in order to remain competitive in global markets. Inducting alternatives to HFCs, such as hydrocarbons, ammonia and carbon dioxide, in the relevant industries should happen sooner than anticipated and possibly become even attractive as the cost of technologies falls. The changeover is actually an opportunity to achieve a leapfrog effect. The imperative, in any case, should be environmental. It is worth recalling that the Vienna Convention for the Protection of the Ozone Layer adopted in 1985 (operationalized later by the Montreal Protocol) followed a phase when major producers of chlorofluorocarbons, the earlier generation of refrigerants, tried to discredit the link between the chemicals and the developing problem of the ozone hole. Persistent and credible science, however, swayed public and political opinion in favor of a phase-out of CFCs. As with the Paris Agreement on climate change, which is strengthened by the Kigali amendments, developing countries will legitimately expect rich countries to aid them as they seek to acquire green technologies for industrial use. Given the impact of global warming, countries and people who have historically never been part of the problem should not have to argue their case for liberal assistance. With the Kigali Amendment in place, the emission of carbon dioxide into the atmosphere is sure to be reduced. To this end, there is a diversity of refrigerants that can be used for specific applications. What should be the ideal/dream refrigerant be? It should be a safe compound (or blend of compounds) with no toxicity or zero flammability risk. It should have no compatibility problems with materials of construction, be inexpensive to produce, and provide a capacity greater than the existing R-22 and R-410A refrigerants. To be absolutely perfect, it should be available as a drop-in refrigerant that operates more efficiently than current refrigerants do in existing systems. Each refrigerant has a GWP with carbon used as the base. Carbon has a GWP of 1. R410A has a GWP of 2088, so if 1kg is released into the atmosphere it will have 2088 times the harmful effect of one kilogram of carbon. R-22 – a hydro chlorofluorocarbon (HCFC) – has a GWP of 1810. Hence, R32 (difluoromethane) has emerged as a viable alternative for air conditioning applications. It has zero ODP and low GWP of 675 (modified = 473) over the 100-year duration period by which refrigerants are rated. The refrigerant has been proposed to substitute R410A, particularly in residential air conditioning systems. It has an ODP of 0 and is a single component refrigerant, meaning it is easier to reuse and to recycle. Risk assessment studies of the refrigerant have indicated a very small risk of fire with various types of air conditioning equipment. R32 has significantly good heat transfer characteristics and a level of performance that make it acceptable at low condensing temperatures, thereby avoiding overly high compressor discharge temperatures. Its performance is very similar to that of R410A across the entire operating range, and it is therefore believed that R32 will be utilized in residential air conditioning systems. It is also relatively inexpensive to produce, is easier to handle because it does not separate, and utilizes familiar technology, keeping costs similar. When coupled with its lower GWP, it is a winner when compared to R-22 and R-410A. With relatively minor retrofitting, R-32 can be manufactured in existing R-22 facilities and is more affordable than today’s price for the original R-22. So, why was R-32 not considered before? The answer lies in its flammability rating per ISO Standard 817 and listing as a 2L refrigerant in ASHRAE Standard 34. However, it has a relatively low burning velocity that is actually slightly lower than ammonia’s burning velocity. Thus, it is not explosive, like butane or pure hydrogen. A spark will not ignite R-32; it takes an open flame to ignite it. Since flammability is the only negative, and it represents a very small risk, R-32 is a good option. So, now more air conditioning units are being introduced that use R32. This will allow the industry to transition smoothly to a situation where the performance and efficiencies needed are achieved, using refrigerants and equipment that deliver a much lower GWP overall. At Daikin, the future of the world’s air is of great concern. The company is constantly paving the path to save the environment. 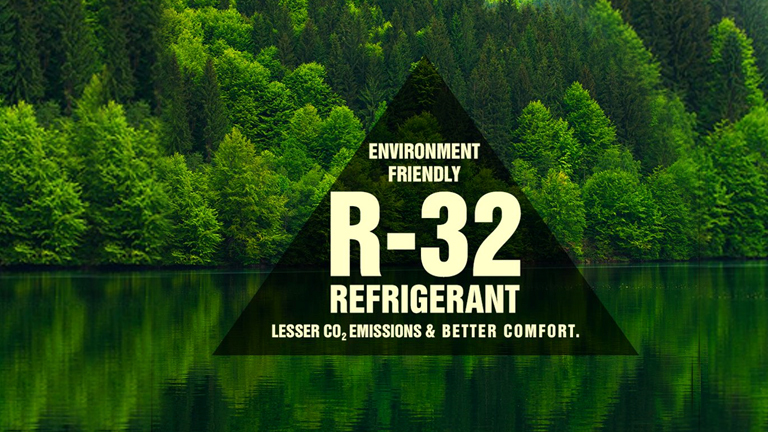 The manufacturer has phased out all its R-22 models and shifted to the green refrigerant, R-32. The brand has sold over 10 million units in 52 countries since its introduction. The company introduced its first R32 unit in Japan in 2012. Units with R32 were introduced in India in March 2013 and Europe later the same year. Australia and Thailand followed in 2014. India and Thailand have become the countries with the largest number of R32 air conditioners sold outside of Japan. Now, the whole world is coming together to find and work on ways to address the global warming issue. The JTKJ series by Daikin is a popular health-giving air conditioner series that follows the legacy of green cooling and features the R32 refrigerant. The series also offers Coanda airflow, in which the louvers of the air conditioners open upward and give a pleasant air conditioning in the room. It is equipped with the patented streamer discharge technology that reduces unpleasant smell and viruses inside the room cleaning the indoor air. The Intelligent Eye with its infra-red sensor automatically controls air conditioner operation according to human movement in a room. When there is no movement, it adjusts the temperature by 2°C. The power chill operation quickly maximizes the cooling effect in any operation mode. The company also offers worldwide free access to patents for equipment using the next generation refrigerant, R-32, showcasing Daikin’s commitment to, and unrivalled expertise in, the use of R32. Daikin remains committed to promote the spread of low GWP refrigerants while encouraging the exploration and development of refrigerants and air conditioning equipment with lower environmental impact.